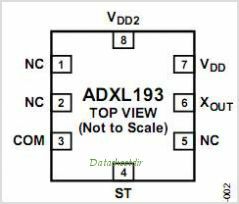 The ADXL193 is a low power, complete single-axis Accelerometer with signal conditioned voltage outputs that are all on a single monolithic IC. This product measures acceleration with a full-scale range of 120g or 250g (minimum). It CAN also measure both dynamic acceleration (vibration) and static acceleration (gravity). The ADXL193 is a fourth-generation surface micromachined iMEMS? 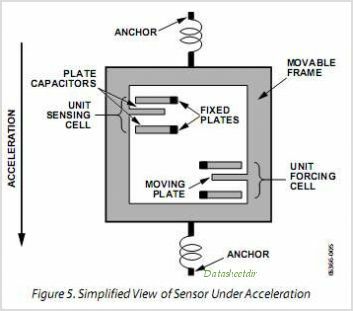 Accelerometer from ADI with enhanced performance and lower cost. Designed for use in front and side impact airbag applications, this product also provides a complete cost- effective solution useful for a wide variety of other applications. By Analog Devices, Inc. This is one package pinout of ADXL193,If you need more pinouts please download ADXL193's pdf datasheet. This is one application circuit of ADXL193,If you need more circuits,please download ADXL193's pdf datasheet.